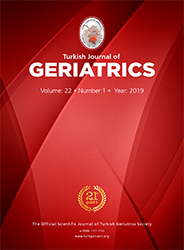 1Trakya University Faculty of Medicine, Emergency Medicine, Edirne, Turkey DOI : 10.31086/tjgeri.2019150577 Introduction: Occupational injuries are among the leading causes of morbidity and mortality worldwide. The rate of occupational injuries in the elderly is increasing daily and is directly proportional to the increase in the elderly population. This study aimed to examine occupational injuries in elderly patients (age, >65 years) admitted to the emergency department. Materials and Method: This cross-sectional study included 122 patients aged >65 year-old who were admitted to the third level emergency department with an occupational injury between January 2016 and January 2018. The demographic characteristics of the patients, type of work accident, type of injury, injured body parts, and comorbid conditions were recorded and statistically evaluated. Results: The mean patient age was 67.8±2.3 years (mean±SD); 85.5% (n:108) of the patients were men, and 85.2% (n:104) were retired. Hypertension was the most commonly observed comorbidity (35.2%, n:43). Falls from the same or a high level were the most commonly observed injury mechanisms (56.7%, n:74). The extremities were the most commonly injured body part (54.9%, n:67); sprains/strains were the most commonly observed injury type (47.5%, n:58). None of the injuries resulted in death.